Which Songs Earn The Most Money For Buskers On The Underground? 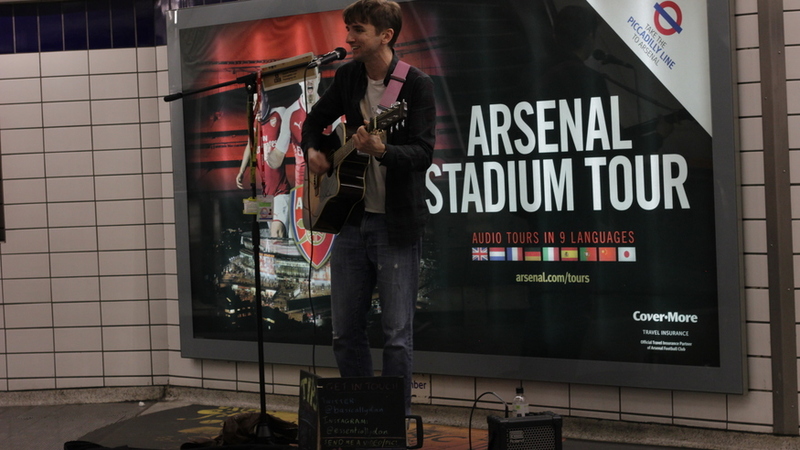 Londonist Which Songs Earn The Most Money For Buskers On The Underground? Do you remember the last busker you saw on the tube? There's a chance they remember you. If you had any kind of interaction with me, I would. If you smile, wave, cover your ears or sing along, I'll record it. One such notable interaction occurred at Leicester Square on a Saturday afternoon during a bog-standard rendition of Bruno Mars's The Lazy Song. It has a catchy chorus which is preceded by the line, "I said it 'cause I can!". Just as I started the "...I can", I noticed a huge group of school kids approach my busking pitch, staring with huge grins on their faces. As they approached, I watched in slow motion as their mouths opened. They all took deep breaths and in a moment my one-man performance was joined by a chorus of voices in perfect sync and harmony and we became an unexpected choir right there on the Underground. Afterwards, they told me they'd come from Croatia on a school trip. These kind of experiences are the reason I busk. But I'm also driven by the sense of accomplishment, encouragement, and extra pocket money that comes from a good session. Outside of my day job, my extra-curricular activities are songwriting, stand-up comedy and playing music on the London Underground as a licensed busker. Like several buskers, I'm armed with a guitar, portable amp and microphone, and I spend two hours at a time playing a mixture of covers and original songs. I've been recording this detail since November 2017, and in that time I've done 473 individual performances over 25 sessions, which means about 19 songs per session on average. I've also played 29 unique tunes (covers and originals) over that period. 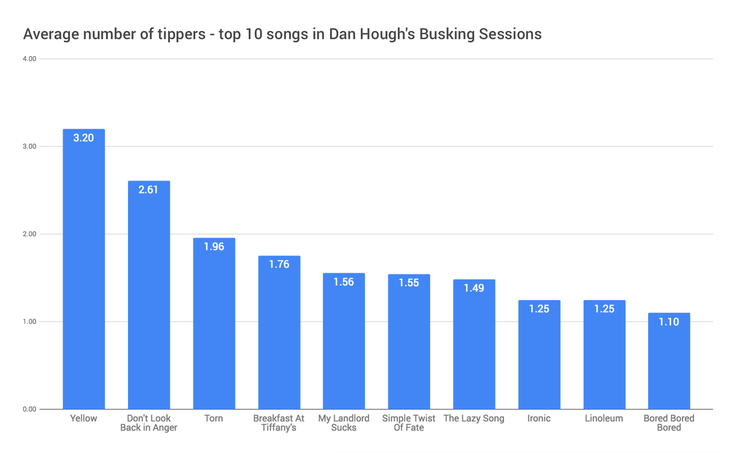 Of those 29 songs, the three which perform best by average number of tippers are Yellow by Coldplay, Don't Look Back in Anger by Oasis and Torn by Natalie Imbruglia — pedants: I know her version is a cover. Torn makes up for 14.4% of my total earnings — not only is it a crowd-pleaser, but I really enjoy playing it. Yellow doesn't even get a label on the pie chart of total earnings as it's such a small contributor; I don't play it much. I also rank busking pitches by their lucrativeness. 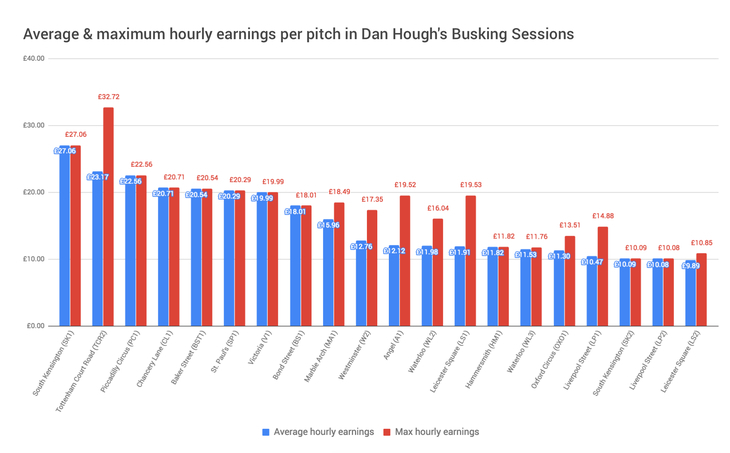 South Kensington (Pitch 1), in the tunnel which leads to the nearby museums, has the best average hourly earnings. But Tottenham Court Road (Pitch 2) is responsible for the highest hourly earnings I've ever made at £32.72. It's early days, but I've played at 50% of the pitches on the network and I'm always trying to repeat pitches to build up a more representative sample. Nonetheless, I can already use the data I have to guide my decisions. 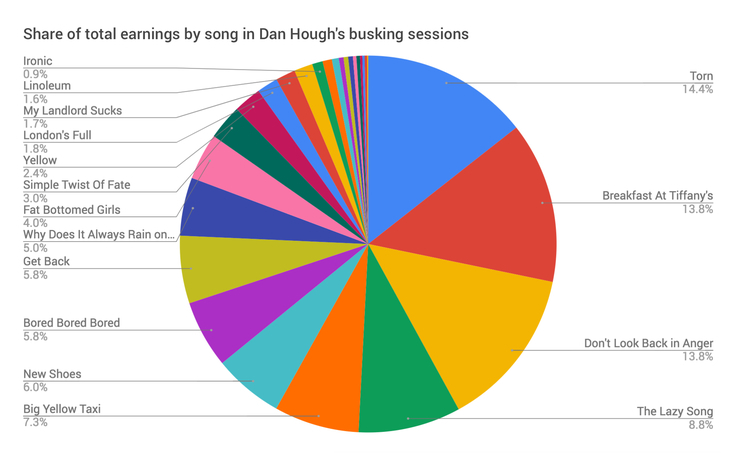 You can find out more about Dan's busking adventures, via his blog, Youtube channel and tweeting @basicallydan.